As marketers, we’re familiar with search engine optimization (SEO). But, what if you’re tasked with app store optimization (ASO)? According to TUNE’s 2014 mobile-usage survey, approximately half of all app downloaders find new apps by searching the app store (53% Android, 47% iOS). To guarantee your app will show up in searches, optimize its app listing, known as app store optimization. ASO is a quick, easy way to skyrocket your app’s listing and value, resulting in higher downloads. ASO also aligns your app listing with mobile users’ needs and expectations, which can lead to a better user experience and higher ratings. Here’s a step-by-step guide to ASO for iOS apps. Once you have firm answers, move on to step 2. Finally, define your competitors and research their current listings. How are they marketing their apps? Brainstorm how you can distinguish your app from what’s already in the App Store. Although the App Store allows for 255 characters in the title, a good rule of thumb is to include your three top keywords in the title. Also, keep in mind that when someone first finds your app in a search, only 25 characters appear. Not until the searcher clicks the app’s link will your app’s 255-character title be shown. That means you need to put your most descriptive, highest-ranking keywords first to draw users’ attention. 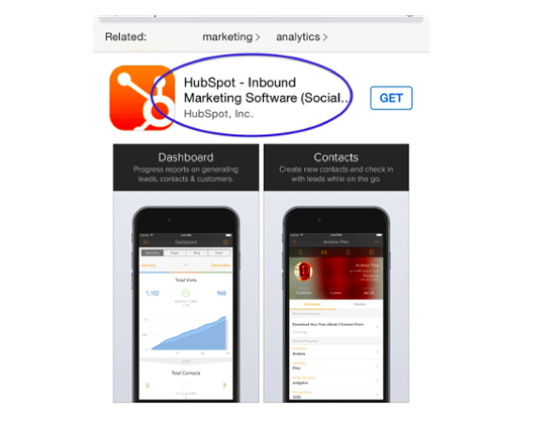 HubSpot’s app’s title is best optimized for search. The first 25 characters tell the searcher exactly what the app is: inbound marketing software. While additional keywords are used in the title, HubSpot puts the product name and top three keywords, first. Similar to the title, you have a limited character count (255) to prove to the searchers your app is the ultimate solution to their problem. Those characters define whether searchers download the app, click for a full description, or keep scrolling to a competitor. Once you’ve optimized those first 255 characters, move on to the full-length description. You’ve already done your homework and know what problem your app solves, so describe that to the searcher. Highlight key features and benefits, and particularly how they address buyer personas’ needs and pain points. 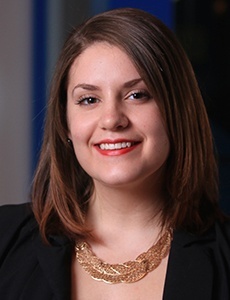 Consider including social and numerical proof in your description to build credibility. This proves to the searcher your app is trusted and loved by other users like them. And, as always, include target keywords, both in the preview and full description to boost search rankings. 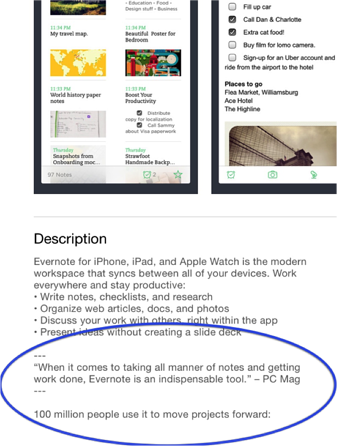 Evernote includes both social proof and numerical proof in the app’s full-length description. This shows the searcher it’s a trusted, credible app to download. You’ve heard that pictures are worth a thousand words. But when it comes to ASO, those images also need to compel users to action. Choose photos that can tell your app’s story. Consider graphics or videos that include both images and text to best explain the app’s functions. Instead of random screenshots, use engaging graphics that immediately display benefits. 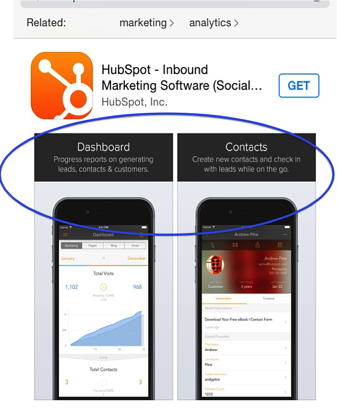 HubSpot’s app includes story-telling graphics. Instead of random product photos, there is a clear description that guides the searcher through the app’s story and benefits. Apple recently announced in June that the iOS9 update will include new options for in-app indexing. For marketers, this means we have the chance to apply SEO best practices to our app’s content. App indexing lets Google search apps just like websites, meaning searches will now yield results based on the actual app, including deep links and optimized content for search. According to Search Engine Land, the following are benefits to app indexing. Google drives higher engagement with apps. The expansion of in-app search means Google can sell more ads and hold down the competition. Improves the search experience for users. Overall, optimizing your app for the best search results can ultimately lead to higher search rankings, ratings and app downloads. Follow the above steps to ensure you’re following ASO best practices. For more on ASO, check out App Store SEO: The Inbound Marketer’s Guide to Mobile. Editor's note: Originally published in June 2015, this post was updated in July 2015 per Apple’s latest app indexing announcement. What ways have you optimized your app’s listing? Comment below and share your ideas.